It’s always nice to see recognition for one of the funnest projects we ever had the pleasure to work on. Tim Magee wrote a great piece coupled with some of the most amazing photography to date on the Rock Bug in this month’s issue of Crawl Magazine (Issue #21). If you haven’t got your issue yet go ahead and steal your friends now. It is packed not only with this great article but in-depth coverage of this year’s King of the Hammers competition. Once again a big thanks to John Herrick, Owner/Publisher of Crawl Magazine, for letting us post a digital copy of The Rock Bug article right here on our blog for free. In addition, we called up Tim Magee and got a hold of rest of the photos from The Rock Bug photo shoot that didn’t make it into the magazine. Hope you enjoy the article and photos as much as we did! 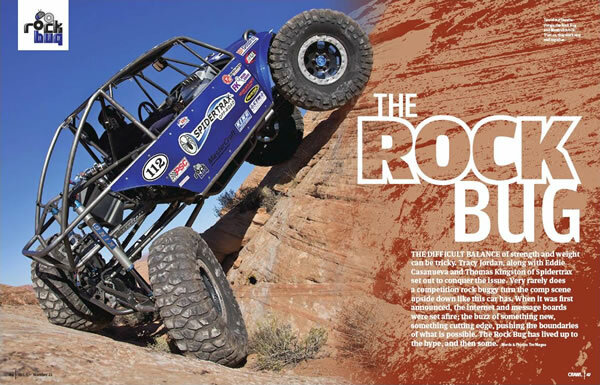 Download the full print article “The Rock Bug”, courtesy of Crawl Magazine. Photos from The Rock Bug photo shoot that didn’t make it into the magazine.